I have started to wear my suede boots. ... And suede seems to be making a comeback this Fall. 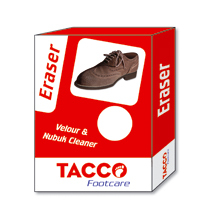 Just in case, you need to clean suede, nubuck and velour materials, the original, genuine, Tacco Eraser can be used on shoes, clothing and handbags. This "eraser" removes the stain without destroying the nap of the suede, and crumbles as you clean.